Could My Kid Be Nearsighted? Children's Eye Health - Could My Kid Be Nearsighted? If your doctor says your child is myopic or has myopia, he's nearsighted. It means that objects far away look blurry to him. It might get worse during his childhood, but it’s easy to correct with eyeglasses. His dependence on glasses to see at distances will not worsen. If your kid has myopia, his eyeball is slightly longer than normal from front to back. Light rays, which make up the images he sees, focus in front of his retina. They should focus directly on it. When this happens, objects at a distance seem blurry and unclear. 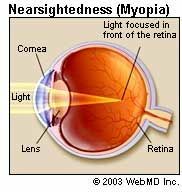 Progressive myopia or nearsightedness is mostly genetic. So he got it from you, his parents. If he uses his eyes for detailed or up-close work -- like reading a lot or playing games on a phone or tablet -- it could make the condition worse. Most kids don't complain at all. Or yours might say it’s hard to see things far away. He might move closer to things so he can see clearly. If he seems to have trouble seeing things far away, make an appointment with an eye doctor. Kids should get their vision checked at 6 months, 3 years, and before first grade. It’s especially important if you have a family history of progressive nearsightedness or other eye conditions. If your kid is nearsighted, he can wear eyeglasses. And he can switch to contacts when he’s mature enough to take care of them. That won’t be before he reaches his teens. And keep in mind that parents play a role in teaching him to care for his contacts and making sure he does it. Ask your doctor if she thinks they can help your child. Doctors aren’t sure if it’s possible to slow the condition down. Studies suggest that combining bifocals with eye drops that have atropine, a drug that will relax your child’s eye so it doesn’t squint on the inside. This treatment shows promise. Since it’s often inherited, it isn’t totally possible to prevent it. However, there are steps you can take to minimize its effect. Make sure your child gets an eye exam early, especially if you have a family history of nearsightedness or other eye conditions. And pay attention: If he has trouble with details on things more than a few feet away at school or while he watches TV from a standard distance, it may be time for an eye exam. American Optometric Association: "Myopia (Nearsightedness)."